The coppersmith barbet (Psilopogon haemacephalus), also known as crimson-breasted barbet belongs to the family Megalaimidae. 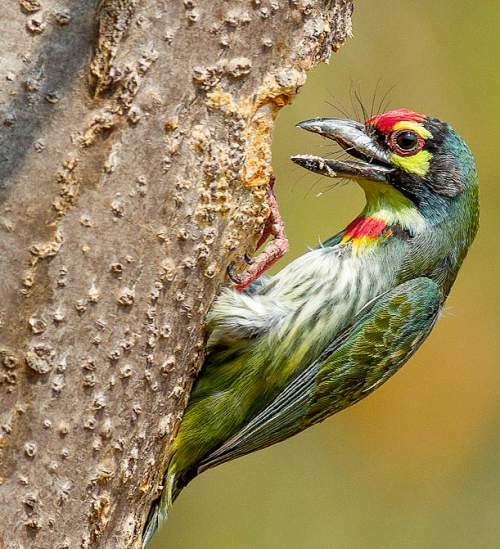 The coppersmith barbet species is distributed in Indian subcontinent, southeast Asia and China. These barbet species have distinctive supercilium, cheek and throat. These barbets are polytypic species. The coppersmith barbet (Psilopogon haemacephalus) is a small green barbet, measuring 15 to 18 cm in length and weighing 30 to 50 grams. The upperparts of these barbet species are green. The underparts are whitish with dark streaking. The adult bird has red forehead and a red patch on the breast. There is creamy yellow supercilium, cheek and chin. The bill is large and gray in color. The irises are dark brown. The orbital skin is yellowish orange. The legs and feet are red. The call of these barbet species is a loud, metallic, prolonged, monotonous "tuk.tuk.tuk.tuk" sound which increases in crescendo. These coppersmith barbets are distributed in Pakistan, India, Nepal, Bhutan, Bangladesh, Sri Lanka, Myanmar, Thailand, Cambodia, Laos, Vietnam, China, Malaysia, Singapore, Indonesia and Philippines. These species are distributed all over India, except for the Andaman and Nicobar Islands and Lakshadweep Islands. In China, they are distributed in southeast parts of Yunnan province. They are absent in Borneo. The coppersmith barbet nominate subspecies P. h. haemacephalus is distributed in the Luzon and Mindoro islands of Philippines. The subspecies P. h. roseus is distributed in Indonesia (Java and Bali). The subspecies P. h. indicusis distributed in Indian subcontinent, southern China (Yunnan), Myanmar, Thailand, Cambodia, Laos and Vietnam. The subspecies P. h. delicus is distributed in Indonesia (Sumatra). The coppersmith barbet subspecies P. h. mindanensis is distributed in Mindanao (south Philippines). The subspecies P. h. cebuensis is distributed in Cebu (C Philippines). The subspecies P. h. intermedius is distributed in Panay and Guimaras in central Philippines. The subspecies P. h. celestinoi is distributed in Catanduanes, Samar, Biliran and Leyte in east-central Philippines. The subspecies P. h. homochroa is distributed in Tablas, Romblon and Masbate in north-central Philippines. These coppersmith barbet species have moderate forest dependence. They normally occur in altitudes from 0 to 1800 meters. The artificial ecosystems and habitats of these species include, plantations, rural gardens, orchards and urban areas. The natural ecosystems and habitats of these coppersmith barbet species include, tropical and subtropical moist lowland forests, tropical dry forests, tropical and subtropical moist montane forests, mangrove forests and tropical moist shrublands. The diet of this coppersmith barbet consists mainly of fruits. Berries, wild fruits, orchard fruits, figs, pipal fruits, guavas, mangoes and custard-apples and also insects like crickets, cicadas, grasshoppers and airborne termites are their primary food. The breeding season of these coppersmith barbet species is from January to October in Pakistan, India and Nepal. The laying season is from December to September in Sri Lanka. Often two broods are raised. These coppersmith barbets are monogamous and territorial. Their courtship involves calling, puffing of the throat and tail flicking. They nest in cavities excavated by themselves. The breeding pair excavate the nest hole, incubate the eggs and raise the young. The clutch of coppersmith barbet contains three or four white eggs. The chicks hatch out after 15 days of incubation. These coppersmith barbet species are non-migrant resident birds. They disperse locally after breeding. The populations in higher altitudes descend to the lower levels during winter. The global population size of the coppersmith barbet (Psilopogon haemacephalus) has not been quantified. The overall population trend of the species is considered to be increasing. In most of its range, this species is reported to be widespread and common. The generation length is 8.5 years. Its distribution size is about 17,600,000 sq.km. Habitat alteration and destruction, lack of suitable nesting trees and capture of adult and juvenile birds for pet-trade are the main threats that are endangering the survival of these barbet species. 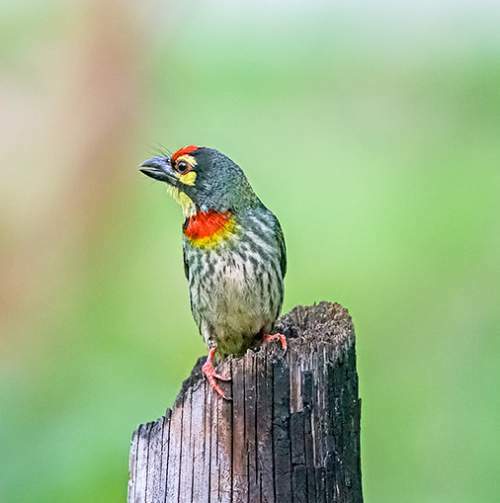 The coppersmith barbet (Psilopogon haemacephalus) does not approach the thresholds for being Vulnerable, either under the range size criterion, or under the population trend criterion or under the population size criterion. The CITES (Convention on International Trade in Endangered Species of Wild Fauna and Flora) status is ‘Not Evaluated’ for the coppersmith barbet (Psilopogon haemacephalus). The nine recognized subspecies of the coppersmith barbet (Psilopogon haemacephalus) are: P. h. haemacephalus, P. h. indicus, P. h. homochroa, P. h. delicus, P. h. roseus, P. h. mindanensis, P. h. cebuensis, P. h. intermedius and P. h. celestinoi. The coppersmith barbet (Psilopogon haemacephalus) is closely related to the crimson-fronted barbet (Psilopogon rubricapillus) and the Malabar barbet (Psilopogon malabaricus). Current topic in Birds of India: Coppersmith (crimson-breasted) barbet - Psilopogon haemacephalus.